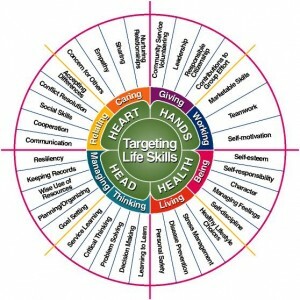 Home » Beyond Academics » What are Life Skills? How often have you come across the term life skills? Can you honestly say that you completely understand the term? Well if you have identified with these statements then you have come to the right place. 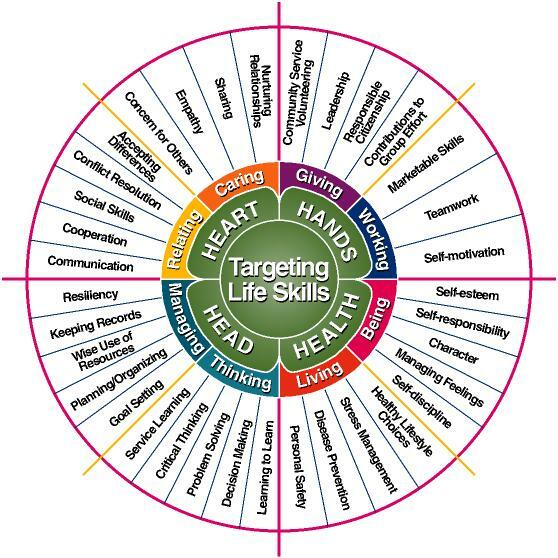 These are skills that cater to 4 main areas namely Heart, Hands, Health and Head or the 4 Hs. Heart: comprises of 2 areas namely Relating and Caring. The qualities that come under Relating are Accepting Differences (individuals should learn to accept each other irrespective of the differences), Conflict Resolution (people should learn effective ways to resolve the conflicts between groups and individuals), Social Skills ( people should learn and practice effective social skills), Corporation (individuals should learn to corporate with each other) and Communication (communicating effectively is a must) while for caring the attributes are Nurturing Relationships (relationships that are formed should be cherished), Sharing (it helps individuals to learn things as well), Empathy and concern for others (displaying empathy and concern gives individuals the opportunity to help others in need). Hands: contains 2 areas Giving and Working. The attributes are Community Service Volunteering, Leadership, Responsible Citizenship and Contributions to Group Effort come under Giving while Marketable Skills, Team work and Self Motivation comprise of the Working area. If you notice both these areas focus mainly on contributing back to society. Health: is divided into 2 categories such as Living and Being. The qualities that come under the heading Living are Healthy Lifestyle Choices, Stress Management, Diseases Prevention and Personal Safety while Self Esteem, Self Responsibility, Character, Managing Feelings and Self – Discipline comprise of the Being area. These areas focus on living a Healthy lifestyle which enhances ones standard of living thus the individual remains healthy. Head: comprises of 2 categories namely Managing and Thinking. The attributes that come under Managing are Resiliency (perseverance is an important quality to have as it makes you strong and keep you going until you achieve what you set out to do), Keeping Records (here accuracy in the tasks completed helps individuals to find the information they are looking for fast), Wise use of Resources (merely using resources is good but the resources should be used wisely), Planning or Organizing (without having a plan to follow all the work that has to be done may not get done in time) and Goal Setting (having a goal in life gives one a sense of direction that is why goal are so important to have) while the thinking area consists of qualities such as Service Learning, Critical Learning, Problem Solving, Decision Making and Learning to learn. This category focuses on developing an attitude of learning in everything one does. Apart from this it also stresses on effective Problem solving and Decision Making because these are very important skills that one needs to develop. These are important skills because as individuals go through life they usually have to make important decisions that will impact ones life especially if the decisions made are faulty. In life individuals also come across various problems the need to be dealt with effectively, that is when having problem solving skills comes in handy. Therefore developing these skills becomes an essential aspect in ones life, if ones wishes to be successful. So let us all start developing theses skills and make a difference to each others lives. And in doing so we can all do our part in making a difference in the world.